Fresh off of winning their first-round matchups, the St. John’s Edge and London Lightning are set to clash in the second round of the National Basketball League of Canada (NBLC) 2018 post-season. Both the Lightning and the Edge battled back-and-forth this season for first place in the Central Division, and finally, both teams will have the opportunity to show which team is the best. The London Lightning have been a staple franchise in the NBLC, as the team has been around since the league’s inaugural season and have made the playoffs every single season. The Lightning finished first overall in the Central Division this year, beating out St. John’s by two games for top spot. London played the Niagara River Lions in the first round and defeated them in four games. The Lightning opened the 2018 post season with a 151-115 victory over the River Lions before winning their second game 124-98 the following night. Niagara gave home fans something to cheer about with a 124-115 win in Game Three before London won 106-99 in Game Four to clinch the series on Friday night. St. John’s pleased home court fans all season and sent a message to the league when the club concluded their first year with a successful 25-15 record – the second-best record by a team in their inaugural season following the London Lightning who went 28-8 during their maiden voyage. The Edge then became the first expansion team to win their first-round series as the club swept the Windsor Express to cruise into the second round. St. John’s opened their post-season with a thrilling 123-120 win in double overtime at home. The team followed that up with a convincing 119-107 win on Sunday afternoon. With the series shifting to Windsor on Wednesday the Edge were up to the task with a 124-117 victory over the Express to sweep Windsor out of the playoffs. St. John’s was the only team to sweep their first-round matchup. Royce White – White entered the 2017-18 season as the reigning MVP of the NBLC, and went on to lead the league in scoring this year with 24.5 points per game. The former NBA first-round draft pick also ranked third in the league with 9.5 rebounds per game and finished fifth in the league with 37.0 minutes per game. Garrett Williamson – On an offensive minded team, Garrett Williamson is a great complementary player for Royce White, as Williamson finished 8th overall with 18.8 points per game. While White missed 11 games for the Lightning, Williamson played (and started) in all 44 games the Lightning played this season. Carl English – Move over Royce White as Carl English claimed the title of league MVP during the 2017-18 season. English was just shy of White’s pace as he put up 23.9 points per game, good for second overall in the league. Carl ranks first overall in the league for points through forty minutes. As well, English is 6th in the league with 117 completed three pointers this season. Carl put up 73 points for the Edge during their three games against the River Lions. English also set the league-record for most points in a game back on March 3rd with 58 points against the Kitchener-Waterloo Titans. Charles Hinkle – Providing St. John’s with their 1-2 punch, California native Charles Hinkle has also been a prolific scorer for the Edge. Hinkle leads the league with 885 points scored so far this season; however landed fourth overall with 21.1 points per game. Hinkle is currently the leader in the free-throw department with an 89.1 success rate. In three games this post-season Hinkle put up 68-points for the Edge, including 30-points in St. John’s double-overtime thriller. 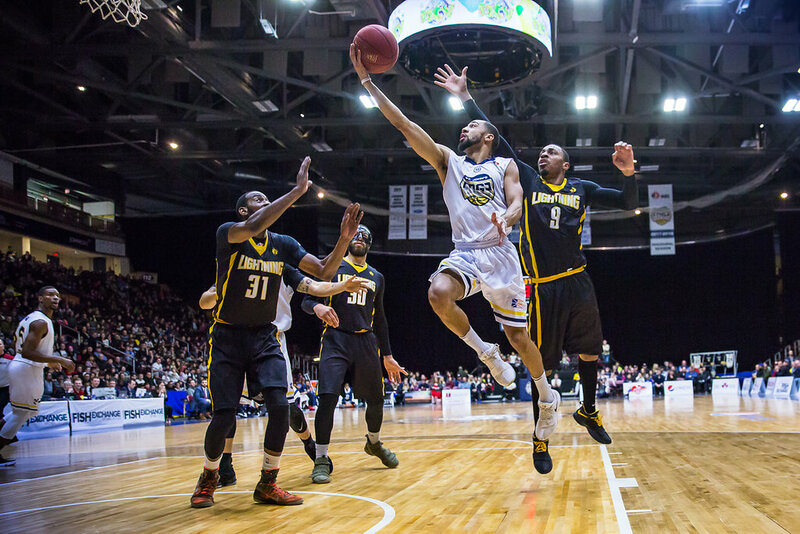 Royce White put up a game-high 25-points as the London Lightning handed the St. John’s Edge a 124-102 defeat at Mile One Centre. The Lightning shot 50% (48-for-97) to cruise past the Edge.